To put it simply, I have been wowed by the Moroccanoil Volume and Style Travel Pack*. In fact, I don’t have anything negative to say. 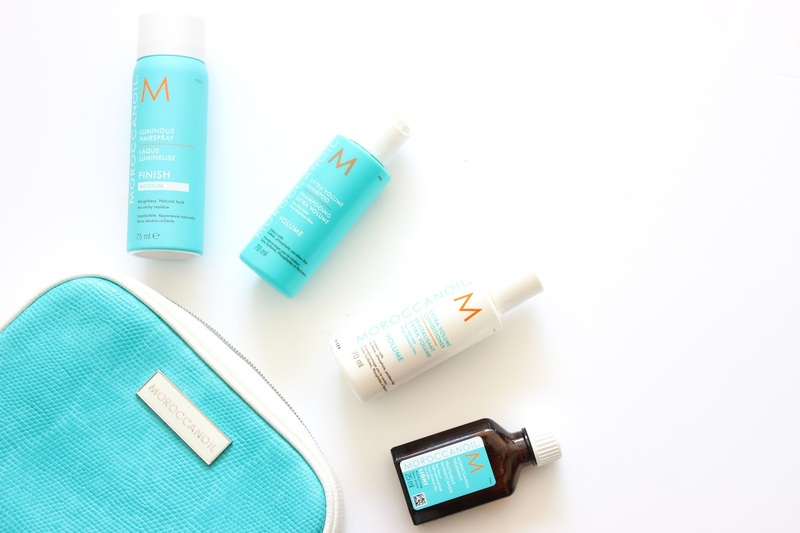 Knocking all other volume hair products off the shelves, Moroccanoil have hit the nail on the head and offer the perfect combination of products in this travel pack, to create full-bodied hair without weighing it down. Make space in your beauty cabinet ladies; this is a set to add to your shopping list. Who knew that a hair oil could leave your hair feeling and looking like it has been blow-dried?! I had read a couple of reviews on this little bottle of oil, but had never been won over. But, boy, this oil gives incredible results. The light treatment instantly absorbs and helps to control fizz, detangle and leaves the ends of my hair feeling extremely silky and shiny. This treatment is formulated with Moroccanoil's signature ingredient, Argan Oil. This powerful antioxidant and UV protector is rich in vitamins, which help to strengthen and condition from root to tip and helps to restore shine to dull hair. I also have to mention that this little glass bottle will last a long old time, you only need to use the smallest amount! The Moroccanoil Extra Volume Shampoo & Conditioner does exactly what it states on the bottle. Working in combination, these two products cleanse the hair whilst adding extra volume. Unlike other volume promising hair products I have tried, Moroccanoil offers volume from the roots without weighing it down, or leaving your hair looking fluffy. The lightweight formula is super nourishing and smells simply divine, leaving the hair silky soft and more manageable. It’s safe to say I have a new favourite shampoo and conditioner and I will without a doubt be repurchasing careless of the price tag. I for one am not a huge fan of hair spray. But this non-sticky and weightless spray offers shine and hold. Formulated with rich Argan oil, this hairspray holds your style without that crunchy feeling. This miniature hairspray is the perfect size to throw into your clutch bag on a night out. This travel pack is available to buy online here for £33.85. The price may seem a little steep, but you can’t put a price on shiny, silky and healthy hair. Plus the products come beautifully packaged in a turquoise croc effect wash bag. This set would be the perfect holiday hair care companion. I’m thoroughly impressed. Need I say anymore?